Our 15,000 square-foot Celebrity Ballroom features 10,000 square feet of pre-function space that can be used for registration, cocktail receptions or pre-show exhibits. It’s rare and wonderful to have North America’s largest Native American museum next door to a state-of-the-art resort city. Surrounded by ancient cedar forests, the Mashantucket Pequot Museum and Research Center provides a unique and interesting backdrop for any event. This spectacular 308,000 square-foot building provides 64,000 square-feet of meeting space, along with complete catering and meeting services. The inspired architecture and setting of the Pequot Museum can host parties of up to 1,200 people and dinner for 500 in a fantastic multi-level environment. 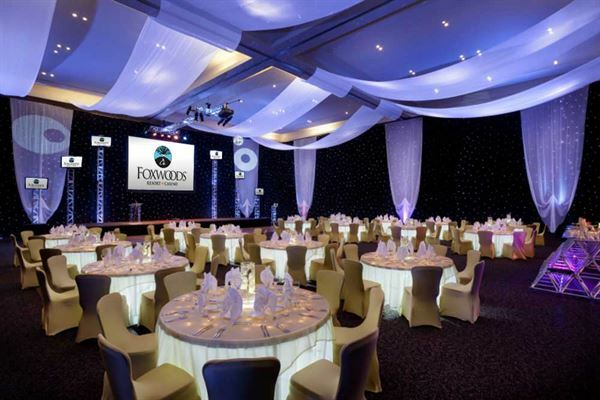 The Foxwoods Grand Ballroom in the Grand Pequot Tower has 25,000 square feet of elegant space, no columns and is divisible into five sections. A 4,000 square foot pre-function area with 23-foot ceilings provides ample room for registration or pre-dinner cocktail hours. The main ballroom can accommodate 165 trade show booths measuring 8’ x 10’. Our 47,533 square-foot Premier Ballroom gives each seat at your meeting or event excellent sightlines. The Premier is the largest ballroom in the Northeast (that’s a fact) and is designed with contemporary elegance and state-of-the-art technology. Its overall design provides for ease of floor plan designs for large trade shows, while adaptable room divisions can accommodate meetings of any size.